1. My American Ipod. There is an engraving in the back: Never forget where you come from. 3. My Japanese SLR Nikon camera D60 (bought from my first internship salary in 2008). It’s old but I would never sell it or give it away. As you can see, the gang is quite international. I’m so glad that they are with me all the time. What do you carry with you when you are on the road? Welcome to the country where you can visit your great-great-great10 grandmother regardless of who you are. Welcome to the country where coffee will be your best friend. Where sometimes your body will move but your heart will stay still. My adventure in this country started with a coffee (buna is the term for Ethiopian coffee ceremony) and ended with a tea (lots of sugar!). It was the first time during all my years of trav elling that a street vendor gave me something without asking for (more) money. 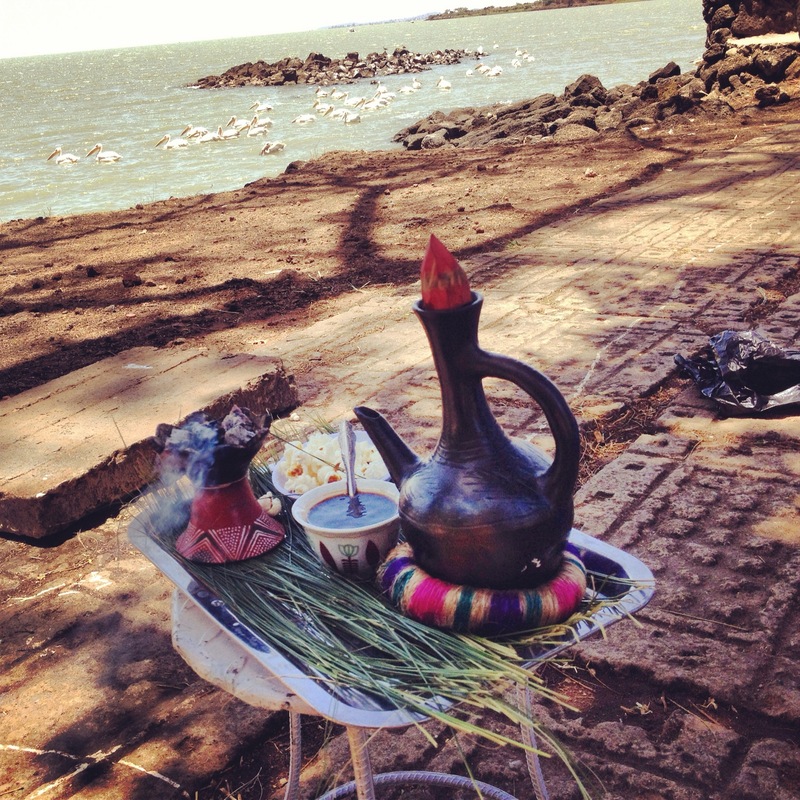 She was a woman who sells coffee in Bahir Dar, next to Lake Tana. The coffee was 5 birr and I didn’t have enough small bank notes with me and needed the big ones for my hotel payment. She simply smiled and shook her head. It probably meant nothing to her but everything to me. As expected, the most common question that I got asked whenever I mentioned my stay in Ethiopia was “Is is safe?”, followed by a few skeptical eyebrows after I said yes. Maybe I was just lucky (even Bunny 1 says that) and met the right persons in the right place at the right time. Maybe someone watched over me. Or maybe, yes, it is possible, the world is quite a friendly place and there are many people who just want to help and protect me. Without asking anything in return. I am not saying that we should walk around with our head in the clouds and ignore all safety cautions. I’m just saying that at the end of the day most of us are actually helpful and care about other people’s well-being. I’m also saying that mass media play a significant role in giving us a very simple picture of Africa. What you think you know about this continent is only a fragment of reality. To feel and understand you need to visit it yourself. This also goes for any other continent or country. Yes, poverty is a big issue. Yes, danger is a big issue. And yes, there are people who just want to help. For those of you who want to travel and explore the world I have only one advice: throw away your prejudices (I know you have them. I do, too). Come unprepared. And you will be rewarded with the most intense and wonderful experiences. Mix them together. Smile (as often as you can!). Take a deep breath and carry the mix inside your heart. Are you ready? Let’s go. My journey in Ethiopia started with nothingness and ended with 8 days, 11 hours and 40 minutes of complete happiness, contentment and entertainment! I have to thank Ethiopian people for that. 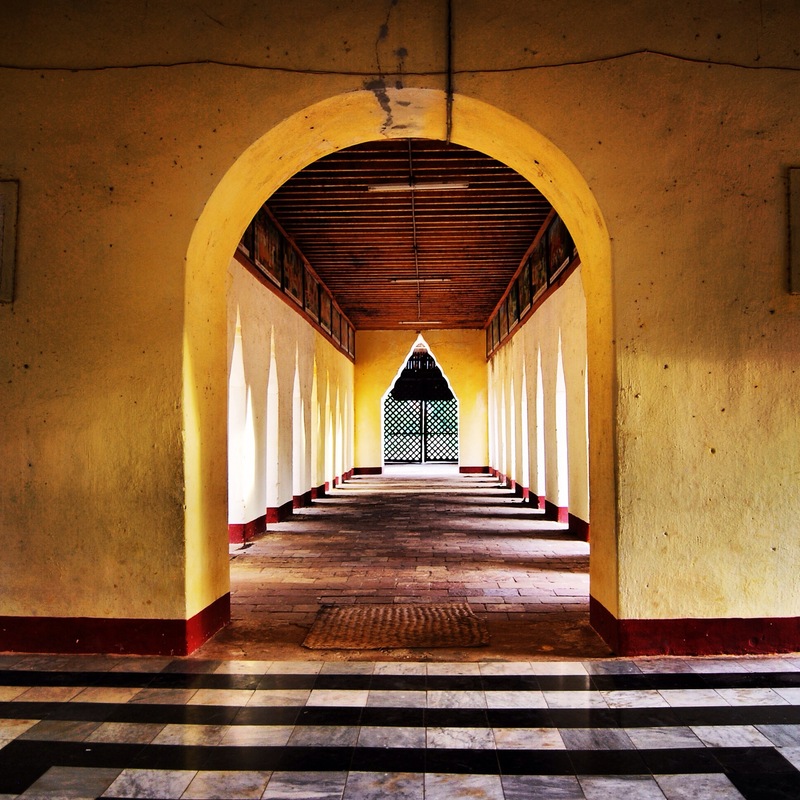 As usual, my best travel moments are almost always unplanned. I don’t mind risking for the unknown. Ethiopia has shown me that this is the best strategy to get the most out of a country. I am not ashamed to admit that I cried on the third day of my stay in Ethiopia. 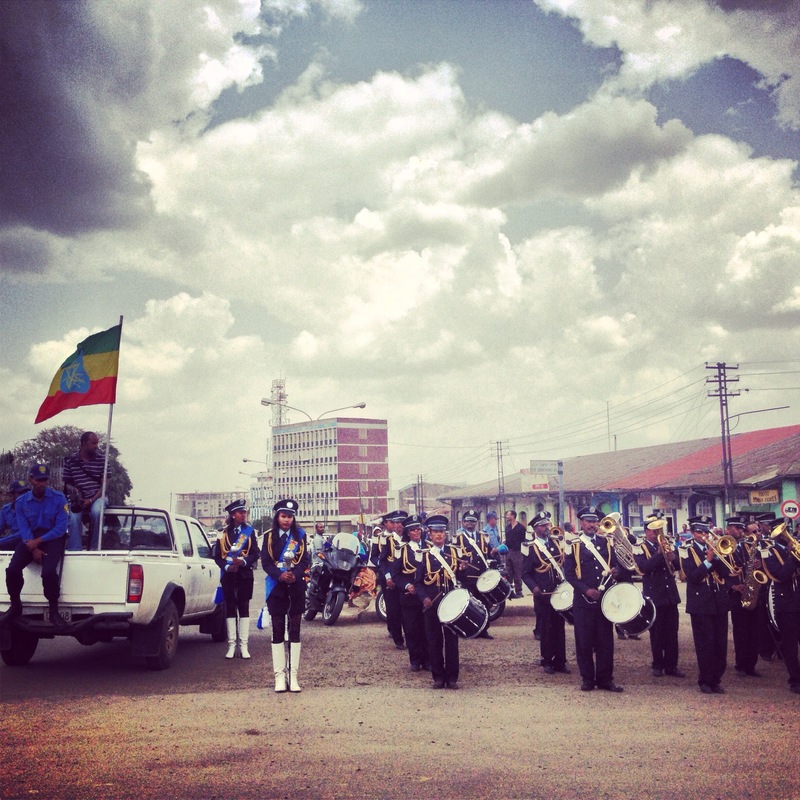 Imagine an Asian woman sitting alone on the ground of the Menelik Square, listening to a group of solders playing the Ethiopian national anthem. What a bizarre situation. What a wonderful moment! Life is on the streets of Ethiopia. It is a miracle within itself. I find beauty in everything I see. Oops, I did it again. 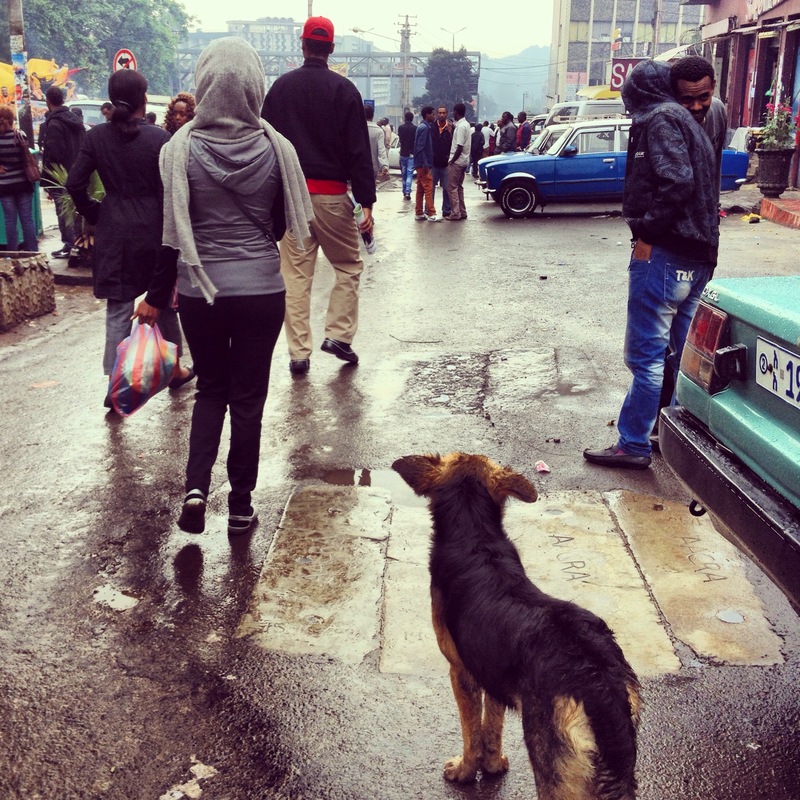 I told my life story to a complete stranger on the streets of Addis Ababa. We chew khat (I didn’t feel anything!) and drank sweet tea and I talked and talked and it felt good. A perfect therapy session! The fourth day in Ethiopia smelled like summer 2009. I felt light and free. I happily indulged in the normalcy of the moment. Watched rain drops falling. Another. And then another. Wish I could stop time. Met a little boy, walking alone on the street. Barefoot. Big innocent eyes. Dirty face. Dirty little hands. So brave. He smiled in a way that made me cry inside. Played with the money I gave him. Carried him to find his mother. Found his mother. She smiled as well. Yes, even amid the crassness and cynicism of our time there are always people who will help you without asking anything in return. Ethiopia is the perfect example for that. Life is simple here in Addis Ababa. Even a stray dog can make me laugh. I met one in the city center today. We discovered the city together! Today I inhaled the fresh air of Bahir Dar; it filled my lungs gorgeously. 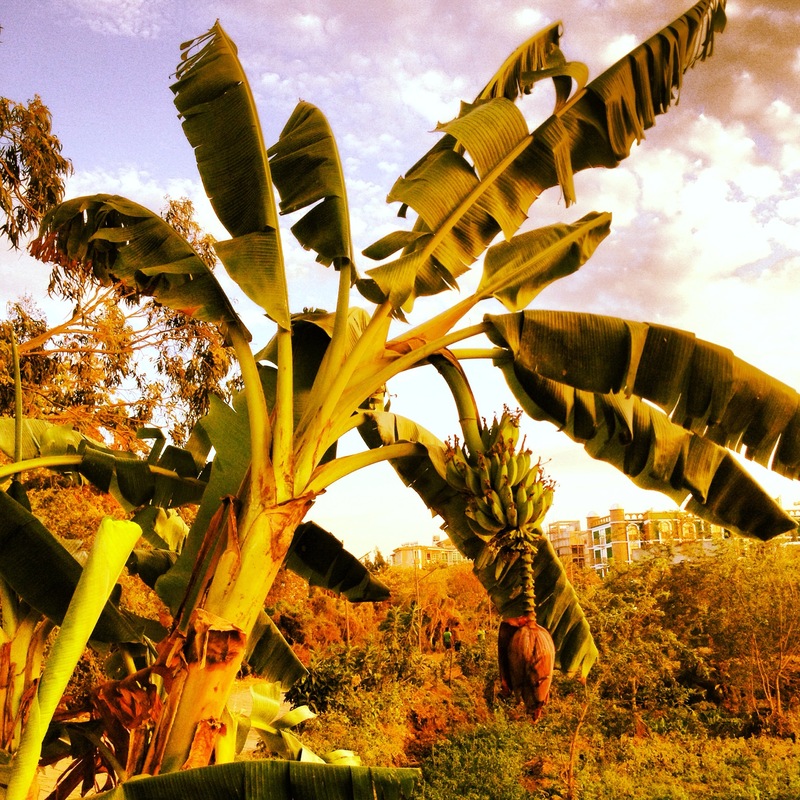 I found my Vietnamese childhood memory in Africa: a banana tree. Ethiopia has taught me that whenever in doubt, smile! When life throws lemons at you, make the best out of them. Use them for tequila. Use them for your food but don’t stay still and watch them rotten. What an important lesson. More photos of Ethiopia on my Instagram Account. You have to scroll down a bit to find them since the most current ones are about Berlin.